Increasingly, government and nonprofit agencies use social media to not only get a message out but to educate and engage citizens so as to cultivate deeper relationships, spread the word about what the organization does and assist it in delivering mission-related outcomes. According to the International Association of Chiefs of Police (June 2014), 73 percent of police departments believe that using social media improves police-community relations in their jurisdiction with 92 percent of those departments using Facebook and 65 percent using Twitter. I have learned that there are six steps in developing effective communication using social media. First, it is important to do your research by identifying which sites are most popular with your target audience and where are they spending the most time. Is it a blog? Facebook? Twitter? YouTube? All major social media websites have search tools that allow you to search keywords to find out what users and groups talking about. To find forums and discussion boards, enter keywords into Google with ‘discussion’ or ‘forum’ added and you will be able to find your target groups. Secondly, create an interesting and memorable profile that includes a friendly picture of the organization or leaders in the organization and your website, logo and mission. Third, listen before talking so that you get a sense of the tone of conversations already in progress and how to strike the right note when joining in. Spend some time reading posts, messages and tweets. Listening helps you understand what people are most excited about, what topics are most discussed, what problems are most common and what participants are most frustrated about. 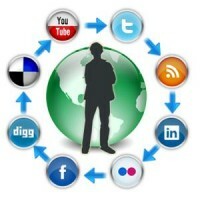 Fourth, engage your target community so as to better understand why individuals spend time visiting social websites. Determine what they like to do most on a website – is it corresponding with friends and family, meeting and socializing online or watching funny or informative videos or listening to entertaining podcasts or playing real-time games. By knowing what they do most often, you can tailor your website to attract them. Fifth, give them information that they want by contributing expert advice, sharing thoughts about your profession, being transparent about your organization’s information, posting common solutions to problems, telling client stories with permission and encouraging community feedback. Finally, build your social media site to be a place worth going to and being involved in. Your targeted community will be drawn to the site because they believe that you care about what they have to say, contribute in valuable ways to conversations that matter to them and respond promptly and politely to them providing great information. In 2011, the Roanoke, Virginia Police Department launched a new initiative as part of the department’s effort to evolve its traditional community policing philosophy to include cyber-community policing philosophy. They increased posts to Facebook, created a blog for engaging citizens, streamed live video and made real-time crime data available to citizens. The first phase not only increased the frequency of posts to the website but also upgraded the posts to include photographs of officers at community events and crime analysis information. The department also held its first social media community meeting designed to teach citizens how to set up their own Facebook pages and protect their identities online. One focus of the meeting was to educate seniors and homebound citizens who often could not easily attend community meetings at City Hall how to use social media effectively. Aa series of monthly videos profiling officers’ careers. Iinterviews with detectives who urged the public to come forward with leads to a recent homicide. A virtual tour of the police training academy. An interactive crime scene investigation tool that allowed citizens to take a virtual tour of a staged crime scene and located evidence. In addition to the press conferences, the police department also enlisted the social media endeavors of WSLS, a NBC affiliate in Roanoke, to air live an interactive show nightly where citizens could communicate with the news anchor by way of social media. The police chief also joined the show to answer questions about the department’s use of technology regarding bring community engagement. Also during this phase, the department posted pictures of incidents needing resolution such as a runaway dog that made a temporary home in a lieutenant’s patrol car. This received a lot of likes and comments from the community, including an offer from a citizen to adopt the dog if its owner was not located. Four days later, the dog’s owner came forward. The same members of the community responded with comments applauding the dog’s safe return home. Additionally, the department’s Facebook page received a lot of traffic during critical incidents such as the report of a man walking through a mall with a gun. forcing the evacuation of shoppers and a thorough sweep of the facility by a tactical response team. Such incidents doubled and tripled the number of visitors to the Facebook page. The third phase of development included the department becoming more interactive with the community by creating a blog, streaming live videos, making real-time crime data available to citizens and increasing crime prevention through education. The department continues to reach out to citizens through traditional means as well such as community meetings, community walks and stories on television and in newspapers. The overall affect seems to be that more citizens like communicating through social media than dislike it. In Roanoke and elsewhere, the misuse of technology and social media venues continues to be a concern and needs to be addressed by every organization hosting a social media site. When using social media, organizations need to establish parameters for the disclosure of information pursuant to law. This often requires social media training of department personnel by executives and attorneys regarding when and how to discuss work in an open forum as well as what information to share while on duty and off duty. At the same time, use of social media to engage the community and stakeholders can be effective and useful.